When you need more than a basic image viewer but less than a full image editor, check out these apps. Like most people, you probably have more than a few photos and other images on your computer. And, like most people, you probably like to take a peek at those images and photos every so often. Firing up an editor like GIMP or Pinta is overkill for simply viewing images. On the other hand, the basic image viewer included with most Linux desktop environments might not be enough for your needs. If you want something with a few more features, but still want it to be lightweight, then take a closer look at these four image viewers for the Linux desktop, plus a handful of bonus options if they don't meet your needs. Feh is an old favorite from the days when I computed on older, slower hardware. It's simple, unadorned, and does what it's designed to do very well. You drive Feh from the command line: just point it at an image or a folder containing images and away you go. Feh loads quickly, and you can scroll through a set of images with a mouse click or by using the left and right arrow keys on your keyboard. What could be simpler? Feh might be light, but it offers some options. You can, for example, control whether Feh's window has a border, set the minimum and maximum sizes of the images you want to view, and tell Feh at which image in a folder you want to start viewing. If you've used Xfce as a desktop environment, you'll be familiar with Ristretto. It's small, simple, and very useful. How simple? You open a folder containing images, click on one of the thumbnails on the left, and move through the images by clicking the navigation keys at the top of the window. Ristretto even has a slideshow feature. Ristretto can do a bit more, too. You can use it to save a copy of an image you're viewing, set that image as your desktop wallpaper, and even open it in another application, for example, if you need to touch it up. On the surface, Mirage is kind of plain and nondescript. 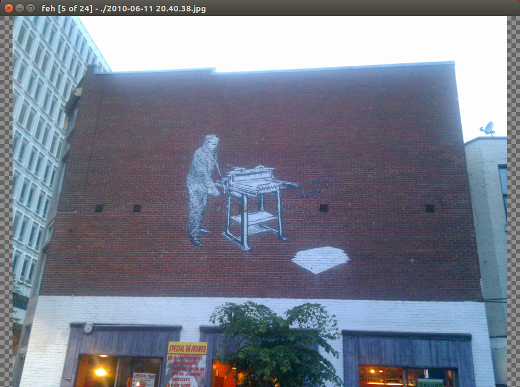 It does the same things just about every decent image viewer does: opens image files, scales them to the width of the window, and lets you scroll through a collection of images using your keyboard. It even runs slideshows. Still, Mirage will surprise anyone who needs a little more from their image viewer. In addition to its core features, Mirage lets you resize and crop images, take screenshots, rename an image file, and even generate 150-pixel-wide thumbnails of the images in a folder. If that wasn't enough, Mirage can display SVG files. You can even drive it from the command line. Nomacs is easily the heaviest of the image viewers described in this article. Its perceived bulk belies Nomacs' speed. It's quick and easy to use. Nomacs does more than display images. You can also view and edit an image's metadata, add notes to an image, and do some basic editing—including cropping, resizing, and converting the image to grayscale. Nomacs can even take screenshots. One interesting feature is that you can run two instances of the application on your desktop and synchronize an image across those instances. The Nomacs documentation recommends this when you need to compare two images. You can even synchronize an image across a local area network. I haven't tried synchronizing across a network, but please share your experiences if you have. If these four image viewers don't suit your needs, here are some others that might interest you. 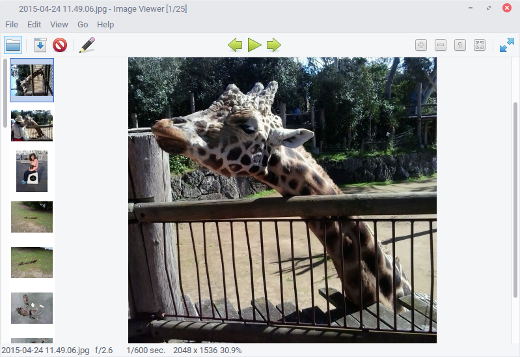 Viewnior bills itself as a "fast and simple image viewer for GNU/Linux," and it fits that bill nicely. Its interface is clean and uncluttered, and Viewnior can even do some basic image manipulation. If the command line is more your thing, then display might be the viewer for you. Both the ImageMagick and GraphicsMagick image manipulation packages have an application named display, and both versions have basic and advanced options for viewing images. Geeqie is one of the lighter and faster image viewers out there. Don't let its simplicity fool you, though. It packs features, like metadata editing and viewing camera RAW image formats, that other viewers lack. Shotwell is the photo manager for the GNOME desktop. While it does more than just view images, Shotwell is quite speedy and does a great job of displaying photos and other graphics. 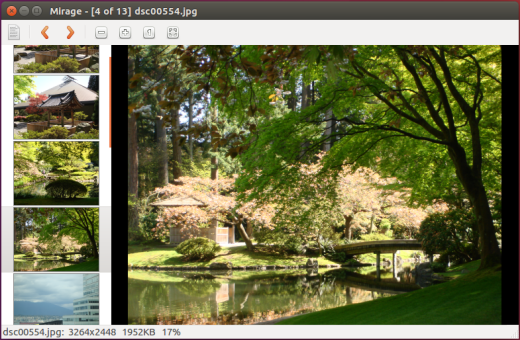 Do you have a favorite lightweight image viewer for the Linux desktop? Feel free to share your preferences by leaving a comment. pqiv ( https://github.com/phillipberndt/pqiv )- is a powerful GTK 3 based command-line image viewer with a minimal UI. Handles WebP image format. Just like most command line functions, you need to type "display" instead of "Display" or you'll get a "Display: command not found" message. The name of the program was lower case in the version I submitted. Seems to have been upper cased during the editing process. I've changed the name back to lower case. And also Eye of MATE which I like, too. I use XnViewMP for format conversions and light image editing. For more advanced editing I use Pinta or The GiMP. 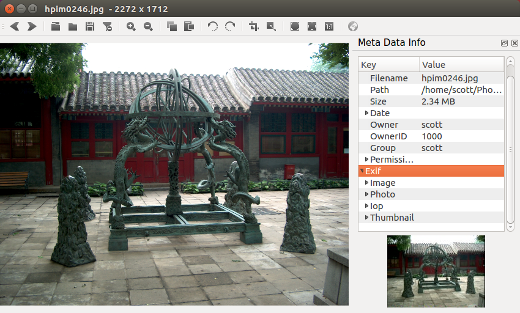 XnView can work with metadata and RAW images, as well as more conventional editing. I'm using PhotoViewerPro, Been using this for years now and I'm comfortable with it for fixing and viewing photos.